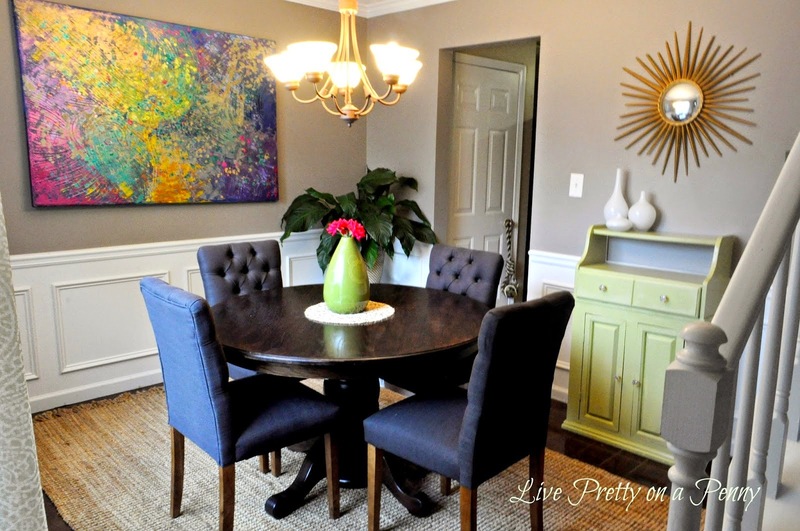 Thank you so much for all of your kind feedback regarding my dining room cabinet reveal earlier this week. Every time I look at that little cabinet, I am in awe of the power of paint. Making over that cabinet gave me the final push to “finish” off this room, which has transitioned over the past couple of years. I am happy with its evolution, but I just have a couple more things that I would like to complete. 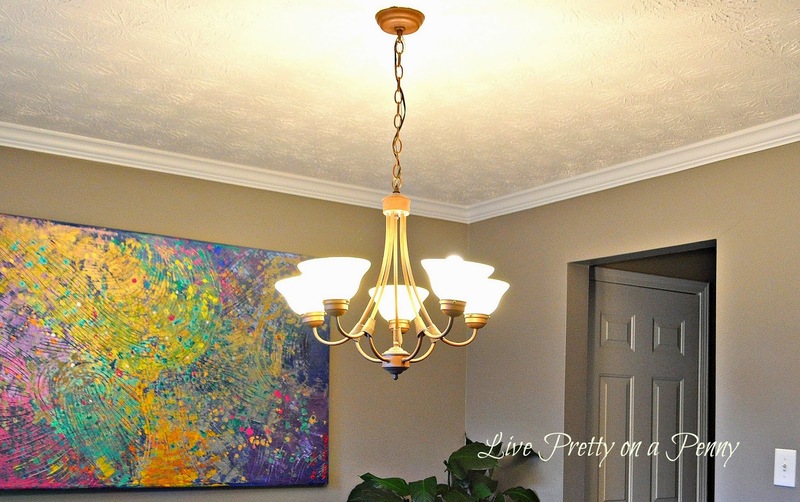 The lighting… This chandelier is the original one that was there when we moved in. I don’t completely hate it, but I definitely don’t love it. So it has to go. I have been scouring Pinterest, and these lighting ideas have definitely inspired me. Roy Sausalto Five-Light Drum Pendant: This sucker costs $855! I know the price will no where near work for my budget, but I still really love the style. I am again attracted to the drum pendant shade. This is the Eden Pendant from CB2. Would you believe that I already own one of these? Purchased it two years ago because it was “cute” and never did anything with it. It will more than likely be the first lighting option that I try.I don’t know if I like that it only has one light bulb slot available. That just doesn’t seem like enough light to me. Lighting is very hard to select, especially for such a visual person like me. As I digress, I would rather buy all of them, hang each one, live with it for a day or two, and take back the ones I don’t like. I know that’s doing waaaaay to much:( But I know I won’t be able to make up my mind very easily. The blank wall… Because this art piece is so striking, I have a hard time filling this blank wall that sits across from it. Mainly because I don’t want anything that will take away from it, or fight against it, if that makes sense. This wall sits to the right of my newly painted cabinet. So the other day while perusing the aisles of Target, I came across these picture ledges. What drew me to this ledge was that it had a pretty gray-washed tone, which I had never seen in a picture ledge. 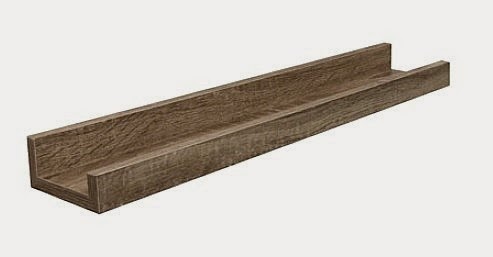 These ledges are by Threshold, they are 23″ long and cost $12.99 each, plus I used the Cartwheel app and received an additional 15% off. I purchased two. Once I put them up, I will let you know how I style them, or heck, if I even like them on this wall. If you have any other lighting suggestions, please let me know! I always love to hear your input. Can't wait to see which chandy you choose. I love the ledges. 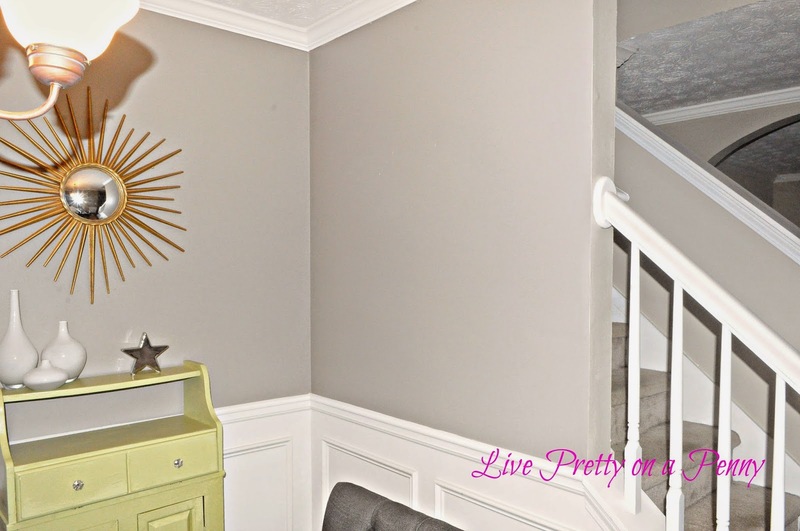 We added them to our dining room, and I love that I can change them out when I want without have to touch up paint!! I look forward to seeing more. I, too, am making changes in the dining room. You are right about the power of paint. I actually painted my set and love the new look .. Still have some more tweaking to do, but it's a slow process..but in the end it'll be all worth it.. 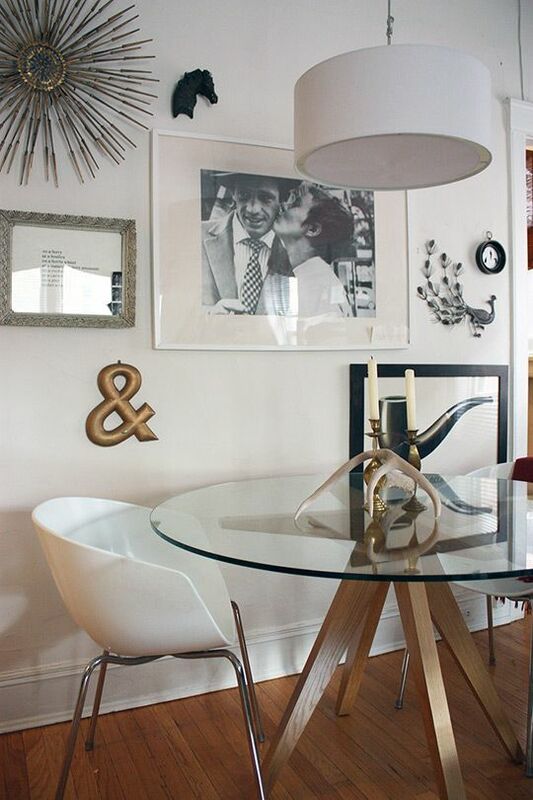 I love the idea of the drum pendant shades! The room is so nice already too so I know it will only add to its greatness! Can't wait to see which fixture you choose! 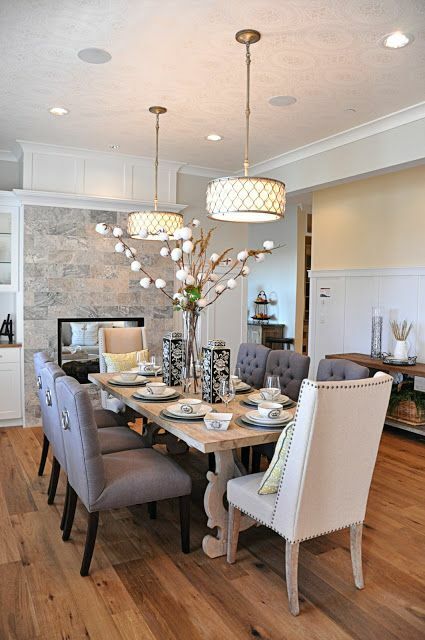 Love the lighting choices & your dinning room. Great color combo! Your lighting inspirations are both beautiful! And I love the picture ledges. I have a few white ones from Ikea. Never knew Target carried something like them, but now I know. 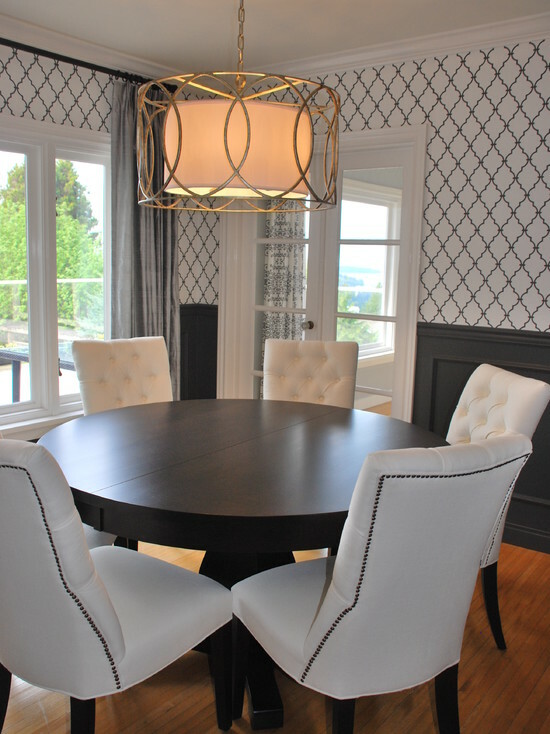 Wishing you the best in your future dining room plans! I'm in love with that painting! Was that a purchase, or a DIY? Where did you find the dining chairs with the rings on the back?